This is how the MSM headlines the story. 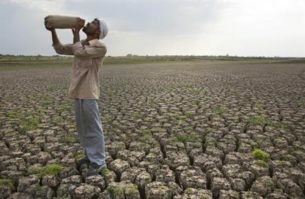 The area of Marathwada is being hit by low rainfall due to climate change. That there is less rainfall is not in doubt, but also underlying the drought are other factors more immediately in the control of humans. As well as issues of mismanagement, politics and industry there are vicious cycles. One is the pressure on farmers to use their land for cash cropping and thus surrender their food sovereignty. Instead of growing crops appropriate to the climate and landscape to produce food for themselves and selling surplus to their community, the market dictates they grow export crops like sugar cane or cotton that need much more water. In drought years the farmers take on debt to increase irrigation. Eventually they have too many low rainfall/crop failure years in a row and can no longer service their debt. Suicide is becoming more common, and people migrate away to take jobs in the city. Another cycle is that the less rainfall there is, the more wells are dug, which leads to further lowering of the water table, making the area even less resistant to drought as the land dries out. But this is an area with an average annual rainfall of 600 – 800mm. This is not arid country (e.g. Dunedin gets 726mm). Even with climate change there are still quantities of water falling on the ground. Hiware Bazar is a village of 1300 people and lies in the same general drought-prone area of Central India but is much drier. In the 1980s, after decades of crop failures, the village designed a collective water management system that restored agriculture and enabled multiple social and economic benefits for the local people. When you store water within the landscape it stays there for long periods of time, increasing fertility, preventing topsoil loss from fast run off, reducing flooding, and making the water available even during low rainfall times. Hiware Bazar has an annual rainfall of 400mm (that’s dry by NZ standards, think a bit more than Alexandra, which is our driest city). The monsoon pattern of rainfall means that it falls in large amounts at a time. This rain can be harvested. 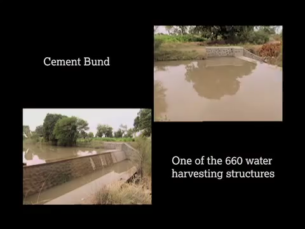 Multiple passive water harvesting technologies were used across the whole watershed, taking advantage of the periodic high rainfall. The village came together and worked on the solutions collectively. It depended on everyone agreeing to harvest water and to stop taking water from bores. In the upper reaches of the catchment water is harvested by ponds, contour trenches and mass tree plantings. These store water in the ground beneath them which both hydrates the soil enabling plant growth, and eventually replenishes the water table. This then in turn revives the wells in the village. In the middle reaches, small earthen berms (bunds) are built to catch any run off from the catchment above. 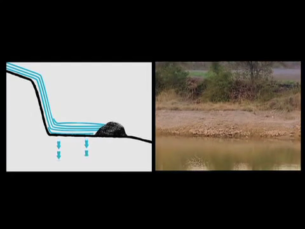 Water either infiltrates the land (and further recharges the water table), or is stored in channels beside the berms. In the lower reaches flat farmed land is surrounded by berms so that rainwater is trapped and seeps into the soil. They also use storage dams. In addition to the food growing areas, similar techniques are used beside the village, leading to the amount of irrigated land rising from 40 ha in 1992 to 550 ha in 2009. As well using sustainable technologies, the changes were made possible by cooperation and collective decision making. The village set limits on bores that allowed the groundwater to rise from 18m deep to 4.5m. The village council measures the level of water in wells and storage tanks and then decides on what crops are appropriate to grow that season. Villagers have agreed to not grow water-intensive crops. Even with low rainfall of 250 – 300 mm, they can still crop potatoes and onions. Changes to stock grazing have increased grass production for fodder from 100 tonnes to 8,000 tonnes, resulting in better prosperity for the local dairy co-operative. Flow on benefits include solar power, sanitation projects, and biomass plants for fuel, electricity and manure. Economic migrant families returned to their land from the cities. One member of the village council describes themselves as being free from climate change threats, and attributes this to having worked collectively for the past 20 years. These are medium and long term strategies for sustainable management and creating resiliency in the face of climate change. They don’t help the people in immediate need of aid, but it’s worth knowing that in the first year Hiware Bazar tripled its area of irrigated land and that such systems can be put in place within a few years. Much of what we call drought is mismanagement of both land and water resources. Despite the geographical, political and cultural differences the lessons for New Zealand are glaring and salient. In drought years the farmers take on debt to increase irrigation. Eventually they have too many low rainfall/crop failure years in a row and can no longer service their debt. Suicide is becoming more common, and people migrate away to take jobs in the city. You forgot about the banks then foreclosing on the property making the local populace even more insecure. One member of the village council describes themselves as being free from climate change threats, and attributes this to having worked collectively for the past 20 years. Cooperation builds societies and makes everyone better off. Competition destroys societies and makes only a few rich while others are in poverty. Despite the geographical, political and cultural differences the lessons for New Zealand are glaring and salient. Yep. We need to copy this for the sake of our own environment. Replant the tops of hills with trees/forests, riparian planting along streams and waterways and stop using artificial fertiliser. Prior to colonisation, India apparently had extensive water management systems under local control and had successfully fed a huge population for a long, long time. A lot of it (just as mentioned in the post) involved retaining rain water above ground. Anyway, the British, in their infinite wisdom, centralised the control of water, sidelined locals and their inter-generational knowledge and essentially fucked up a lot of places. I was given a very interesting short doco on Indian village water systems a wee while back that highlighted the historical context and the current struggle to wrest control away from the still centralised Indian bureaucracy – a colonial hangover. One problem was that the knowledge of many of the land’s subtle intricacies has been lost now. By the way, not sure about comparing the likes of Dunedin to Marathwada on a straight mm of rain basis – one is in a temperate region and the other relies on monsoon rains. That makes sense. One of the links near the start goes to an article about mismanagement of the big dams in the area, which I assume is a hang over from the historical problems. I didn’t focus on that because big dams won’t solve the problems (and will probably make it worse), so it’s great to get some perspective on the pre-industrial systems (schwen below too). Re the Dunedin comparison, the thing about sustainable water harvesting is that it stores water over long periods of time. Good sustainability design will take into account local factors e.g. monsoon patterns, or deluge cycles that Dunedin gets more often now. If this was being done in the Dunedin area you’d have to look at things like flood mitigation, and at other times less rainfall in single events therefore more propensity for evaporation. In other places in NZ it’s the NW wind that causes intense evaporation even where there is rainfall. All those things can be accommodated in good design. The value in a local comparison is to demonstrate that shortage of rainfall is not the main problem here or there, which was what I wanted to highlight in the post. Apparently, these water harvesting arrangements are not a new innovation, but were very common in pre-British India. During colonial rule, the system was allowed to decay, with ponds and dams silting up and irrigation canals choked with weeds. The British were too reliant on ground water, and even quite lately, cheap or subsidised electricity meant that ground water was pumped with reckless abandon. This is an example of a return to tried and true centuries old technology that works for it’s context. The depletion of the North American and Chinese ground water resources beneath their great plains will be the next disaster to watch unfold. Thanks, that’s so good to hear. Bill has said something similar above. I wrote the post from watching the video, which didn’t go into the where they got the tech from. But there seems to have been quite a lot written about the village (and it’s been doing this for a reasonable length of time), so it would be interesting to find out. What you and Bill are saying makes sense, that the knowledge of that would still be in the culture. The US and Chinese situations are interesting because they also have their own examples of good sustainability and land restoration design. Might do another post at some point on that. Irrigation canals, ponds and canals is the wrong approach to water management. They invariably “silt up” and the communities they support, collapse. A good point Robert except that your point applies to when the hills are barren. But if the harvesting and planting is done of the hills there will be less erosion/silt to fill the dam. So rather than the grapevines I saw last time in some small areas there were permanent trees planted from top to bottom the no silting would occur. at least if the re-forestation took place in the areas up stream of the dam. A sadly humorous story “dumb westerners v. canny orientals” ? You might want to be more specific about techniques Robert. Taoist is a bit obscure. I get that you are wanting to point to underlying philosophies and how they affect the tools and systems one uses, but I think many people won’t be getting what the difference is. I point to swales as something obvious that people can get their heads around in terms of understanding about keeping water within the landscape. Concrete examples of what’s the difference between one system’s use of water compared to say channels and ponds would be good. Ok. Store water in soil. To do that, encourage the organisms that create the medium that holds water molecules. To do that, stop using biocides that kill those organisms. Feed them. They like wood. Grow plants that have deep roots. Annuals are traditional by perennials are better. Don’t steal water from streams, rivers or aquifers – they are doing their job and supporting their populations, you’ve no business taking their stuff. Attract water to your catchment, if it has been messed with (they’ve all been messed with). Grow trees. 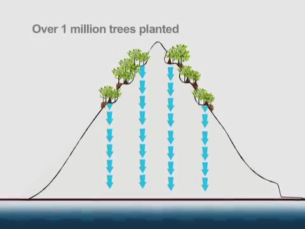 Trees are pumps. They create clouds. Rain falls from clouds. Rain is good. Cover your soil with a thatch of mulch, living and having-lived. Don’t import mulch – you are stealing it from an environment that utilizes it. Grow your own. Plant wind shelter. Wind steals water from the soil. Cutting down trees is a greater problem than is realised. Don’t cultivate. Water exits soil fast when it is ploughed. Plant into mulch. Don’t use any “icides” at all. All of them are life-takers. More life is the way. Life needs water. Do both in unison. An outstanding post weka. Thank you. Wow, there is a lot in there. The thing about digging down stream beds is scary. We are so complacent in NZ about our rivers going dry, as if it’s a nothing. Well the National / Fed farmers view seems to be that any water that reaches the coast is wasted, so they may be complacent about rivers running dry. However, where I live the river is the water supply for the town ( as well as being essential for the health of the estuary ) so the river running dry would NOT be a “nothing” , it would be considered extremely serious . 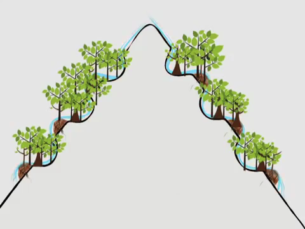 Very similar to Bill Mollison’s permaculture concept where one of the main ideas is to slow water travelling through the landscape as much as possible. Completely foreign to our farmland here where you see mostly grassy hillsides and a little bit of native vegetation regnerating in the gullies and few attempts to harvest water. Would that farmers in NZ had to read the Permaculture Designers Manual! this was a good read. Food for thinking. Good post…..see this is a village of 1300 …have always thought that small is better, far more chance of cooperation,less chance of exploitation and corruption, in fact the only downside of small is the inability to fight off big. Me too. Once you get so big that people can’t know each other or feel the impacts of decisions made you get a kind of disconnection. One of the inspiring things is the village was about to make these changes themselves. I’m not sure how possible that is once you get really big. It’s easy weka, you vote in representatives who make decisions on our behalf ……..
Divide the “really big” into a series of “small enough”. A town is a cluster of villages, a city a clumping of towns. Very true, time to devolve. The rural village is dead , not sure if it was always the plan to clear small farmers from rural nz ,but we are rapidly heading to a country of lords and serfs out here. big farms with minimal staff numbers means that the sort of management it would take to farm in a truly eco freindly manner is not possible. Collect rainwater from your roof for drinking, cooking and washing. not sure if it was always the plan to clear small farmers from rural nz ,but we are rapidly heading to a country of lords and serfs out here. It was. 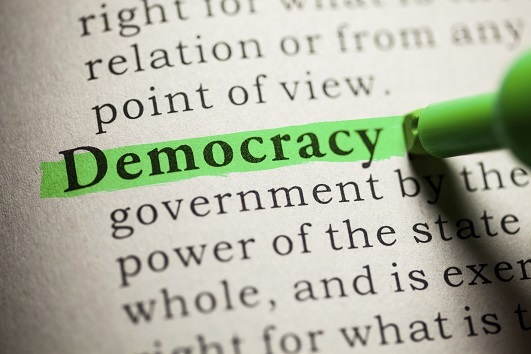 That’s what the present socio-political system is about – bringing back feudalism. Ha! We can be hedgerows! How can I email something to you, weka? will flick you an email when I am at my email again. Not sure about that mate. I live I’m a small rural village – life is booming, community is thriving and we also have every issue under the sun as others do. Everyone benefits from small communities imo. Thanks for an awesome post weka – I really enjoyed it. Not sure where you live is typical of small rural communities though tbf 🙂 (wish it was). Some appear to be struggling. Haikai Tane and Taoist farming. Is your own garden rich with water-holding humus? Charity, you know where it starts! Just like to say Robert I really like your positivity and abundance of green thinking ! There’s a pretty clear connection between the huge amount of topsoil being carried along by the Manawatu River every time it rains, and all those Central Hawkes Bay hills that have been denuded of trees and are covered in slips. Our approach to this is moronic. That’s the story of civilization. Can be reversed though – halted and remediated. Given new thinking. Great article, Weka. Lots of food for thought there. Wouldn’t it be great if some of our local authorities had the imagination, the intellect to do the research, and then the will-power to get on with doing the sort of thing mentioned in your article. ECAN for instance – could do this. but maybe even better, perhaps some of those big dairy farms could be converted back to their natural state for grain or tussock. And similarly examples such as those mentioned above in 6, 8, 14.